Payments: International orders outside of the United States and Canada will only have the PayPal payment option available. If you wish to pay via credit card, we suggest opening a PayPal account and linking your credit card to your account. You can then make a PayPal payment for your order using your credit card. Please visit PayPal.com for more information regarding PayPal accounts and options in your region. Shipping: Glowproducts.com will display any available shipping options to your region via UPS. You may place your order online and the available shipping options to your Country will be displayed. If you prefer to use your own shipping account # and ship product using a preferred carrier, just let us know which courier you would like us to ship with and let us know your account #. Also please note that shipping with us pre-paid is generally much cheaper than shipping on a courier account freight collect. If you have any questions about shipping on your courier account, please email us at info@glowproducts.com. Glowproducts.com is not responsible for any additional taxes, duties or brokerage fees charged by your government. Please check these prices with your government before ordering. We do not have this information available to us and is dependant on your specific Country and Region. If you are not satisfied with your purchase from Glowproducts.com please contact us within 5 days of receipt. If you find that over 10% of your order is defective then we will either replace the product or give you a refund on the defective merchandise. The ultimate decision for accepting returns or giving refunds or credits remains that of Glowproducts.com. Glowproducts.com will only accept returns on merchandise in its original packaging and condition. Please note that Glowproducts.com does not accept returns on chemical glow products and we cannot accept returns on items that have been damaged due to negligence. Please contact our Customer Service Department if you have any trouble with your order at 1-877-233-4569 or email us at info@theglowstore.com. Please note that our guarantee does not apply to products on our 'Specials Page'. Claims for shortages in packing or defective merchandise must be made with our Customer Service Department within 5 business days of receiving your goods. For all returns authorized by Glowproducts.com, the customer is responsible for all freight charges and a 10% restocking fee. Please when possible, provide images or video of the damaged goods to our email address at info@glowproducts.com. If a package is delivered in a visibly damaged state, or if you received less than the number of packages stated on the delivery log, inform the driver to make note of such damage or shortage on the delivery log. If not you may lose your right to make a claim to the delivery company. Please notify Glowproducts.com immediately if your package has been damaged during shipping. Glowproducts.com uses UPS Courier Services to deliver our products. Shipping times will vary and may be longer if you are shipping to a remote location. If you have any questions regarding shipping prices or time in transit, please call us toll-free at 1-877-233-4569. If you require a faster delivery than our Standard Ground Shipping times, we also offer Priority Overnight within North America. Saturday Delivery is also available to most areas in North America, please give us a call if you are interested in a Saturday Delivery. If you are shipping to Mexico, Alaska, Hawaii, the North West Territories, the Yukon or Nunavut; be aware that UPS Standard ground shipping is not available for these locations and that only Air Shipping is available. Extended area surcharges may apply to some remote locations. For international orders outside of Canada and the United States, shipping time estimates are usually between 2 to 4 days for delivery for UPS Express Worldwide or 4 to 6 days for delivery for UPS Expedited Worldwide. Glowproducts.com is not responsible for any additional taxes, duties or brokerage fees charged by your government. Please check these prices with your government before ordering. Extended area surcharges may apply to some remote locations. If you prefer to use your own account # and ship product using a preferred carrier, just let us know which courier you would like us to ship with and let us know your account #. 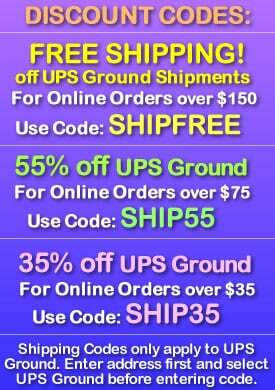 Please note that UPS Ground shipment pick-ups must be pre-arranged by the customer with a valid UPS Ground account #. Also please note that shipping with us pre-paid is generally much cheaper than shipping on a courier account freight collect. If you have any questions about shipping on your courier account, please feel free to call us at 1-877-233-4569. Glowproducts.com is a division of The Glow Store, Inc. and we respect the privacy of our customers. We do not provide any information regarding our customers to any unrelated third parties. That means The Glow Store, Inc. will not sell, give, or trade your personal information with any other party. Information collected through our web site or by phone is collected and used solely by Glowproducts.com. All online information is protected by using SSL encryption. If any part of your order is out of stock, Glowproducts.com will contact you by email or phone to get your specific instructions regarding the order. If you have any questions regarding back ordering or out of stock item, please feel free to email us at info@glowproducts.com or give us a call, toll free, at 1-877-233-4569. There are no additional sales tax, customs brokerage or duty fees on orders shipped to the United States. All Canadian purchases are subject to applicable taxes depending on the province.